What started as a simple, late night stroll for a man who needed to clear his head from the hassles of the season turned into a life-changing moment. This enchanting and endearing Christmas tale invites you to take a closer look at the wise men, Mary and Joseph, and even the Christ child himself. Freshly repackaged with updated art throughout, A Walk One Winter Night will open your eyes to the joy and wonder you can experience this holiday season. 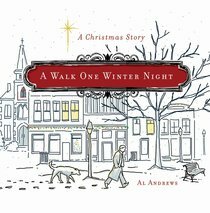 About "A Walk One Winter Night"
Al Andrews is the director of Porter's Call, a ministry to recording artists and their families in Franklin, Tennessee. He self-published a children's book titled, The Boy, The Kite, and the Wind. Most recently Al has founded a charitable enterprise known as Improbable Philanthropy. Al Andrews devotes 100% of the profits of his children's books to charities that aid children in crisis and inner city initiatives.